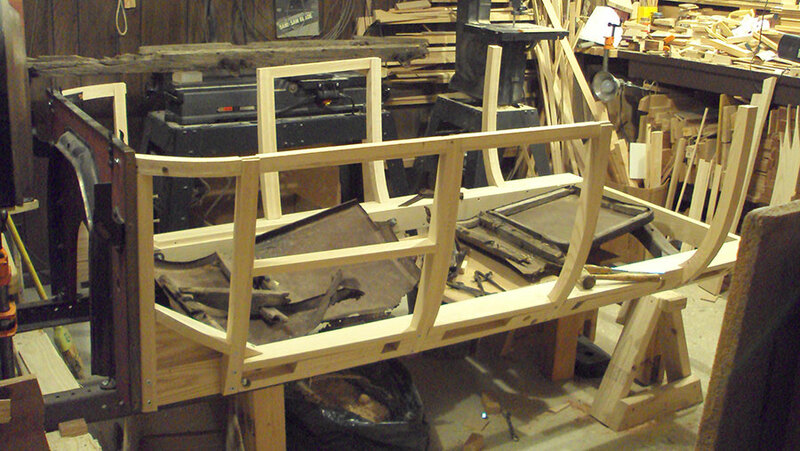 This is the start of the wood framework for my 1914 Touring. 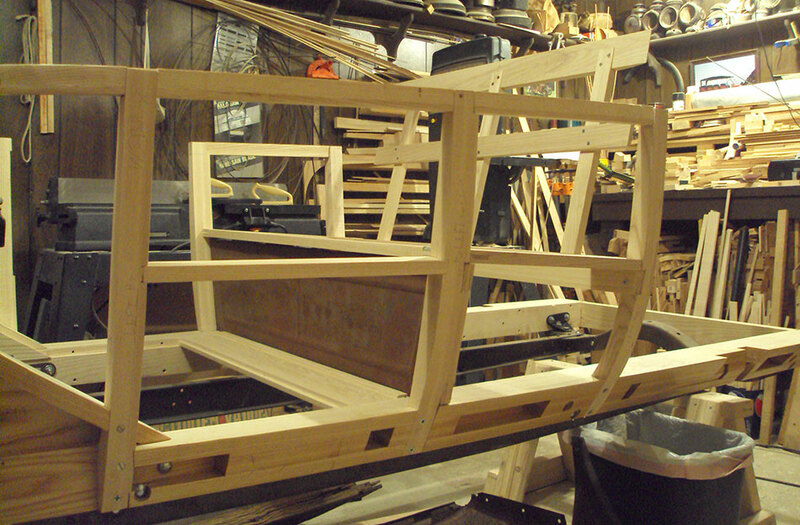 I am using Ash I will post more pictures as the progress continues. It is looking good! 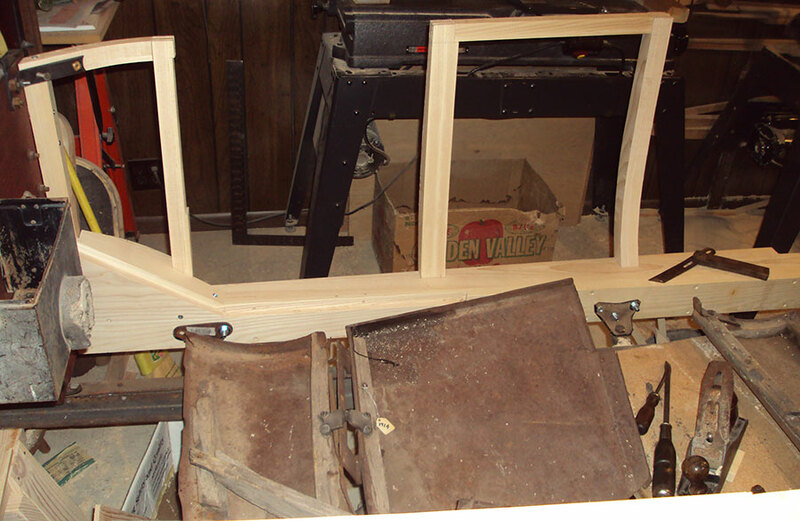 Are you primarily using the Mel Miller plans and fitting the wood to the sheet metal? Yes Hap. The plans are very good reference but I am finding some discrepancies between the plans and body parts I have. There were apparently changes as the cars were produced. No surprise there. 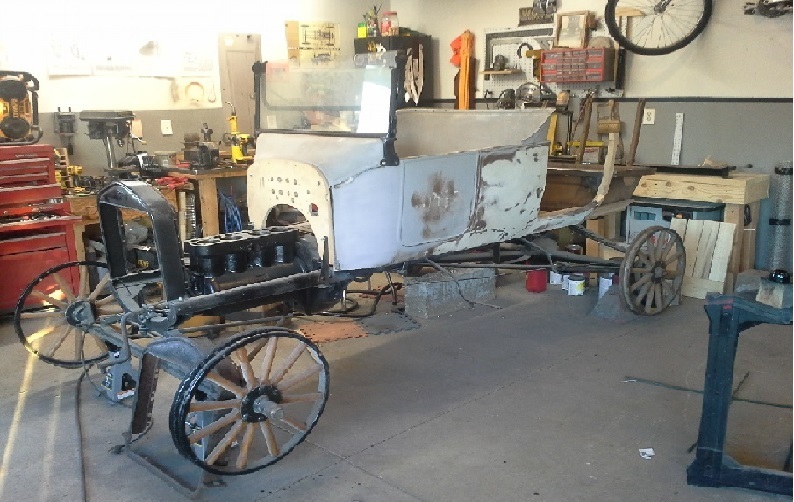 Don Langs '14 for sale in the Classifieds the other day answers some of the questions. Body building isn't that difficult but there are always plenty of surprises. Also many good pictures on the forum over the years but sometime hard to find. Looking good! Great photos. I may have to bookmark this one to help as a guide for if I get to my '15, even though it is a runabout. Great job. I have both a 13 and a 14 to do myself. Also on the outside tack strips, I "steam" bent mine. However, Cubels has a synthetic strip available that you heat with a hot gun and bend into place. I haven't used them, but maybe someone could jump in if they have experience with them. I used the synthetic strips that Cubels sells on my 21 Touring rebuild. I have to say they worked really well. I'm not a 100% purist and besides the tack strips get covered over anyway. But to each his own I guess. Call me a 95 percenter! The material works pretty well and the use of a propane hand held bottle torch heats the strip to where you can work the curves in the correct position easily. I didn't have a heat gun. It drills and tacks well with no problem that I could tell. Thanks for the kind words and suggestions. 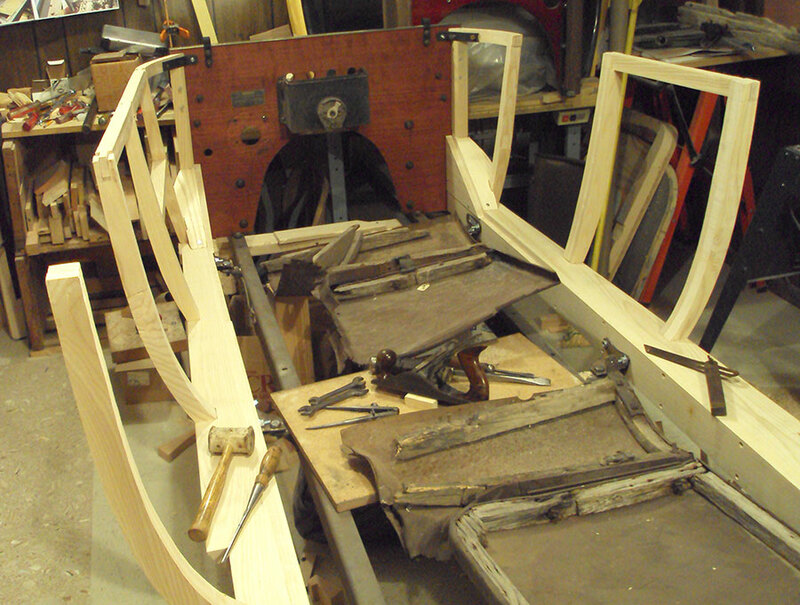 I guess the "not difficult" is compared to a Tudor and a Coupe I re-wooded without plans and very few and poor pieces for patterns. Just a hint, you might want to add some extra support for the joint on the driver's side at the upright just aft of the curve leading to the firewall. The wood breaks at that spot on nearly every '14 and it results in a tear in the body panel. Very nice Richard. Having just finished a roadster, I can appreciate what you're doing...VERY nice. Eric, is this the joint you mentioned? Thanks for the heads up. I will make a metal "T" to reinforce it. I suppose mounting a spare tire or 2 on the running board added extra stress there. Charley, If used Oak on a few bodies with good results but was told Ash was the only way to go. I our local suppliers stocked Sycamore I would surely try it. Scott, I have surely enjoyed the pictures of your Roadster and your comments. Great car and very nice photos. "I used Oak on a few bodies with good results but was told Ash was the only way to go. I our local suppliers stocked Sycamore If would surely try it". A good friend of mine whom I've known for many years, has been around vintage autos all his life. His father was one of the founders of the C.C.C.A. and his grandfather founded the largest independent automobile body manufacturing company in Michigan. 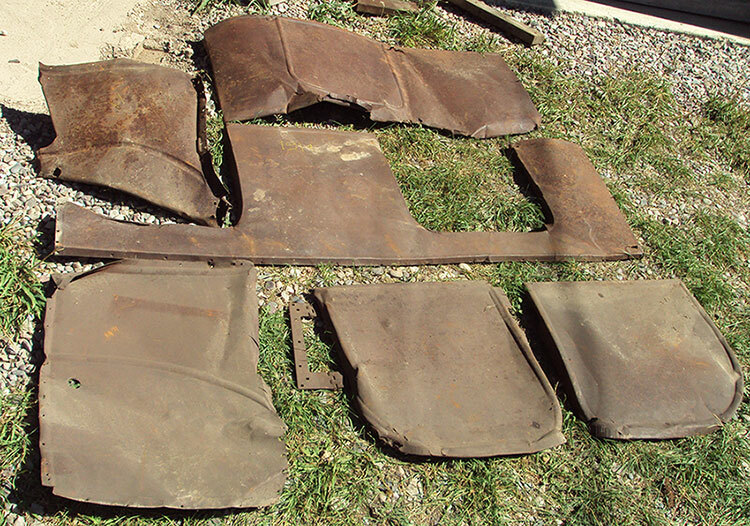 They built bodies for many, many car companies including Ford. Although the type of wood they used for body manufacturing was not 100% exclusive, the wood species of choice for them was ash. It looks like you have enough extra wood around to make a few bodies. Great work. It took me an entire winter to get to that point. The lumber yards around me were asking far to much for rough cut ash. So I cut one down, made a kiln and dried and dimensioned my own... I should have just bought the lumber from the yard. Great idea Paul. I remember an article about a fellow who thought leather was too expensive so he bought a cow, tanned and dyed the hide. However the dye didn't dry right and ruined his white shirts. We all do things our own way. Mike, thanks for the Ash comments. I did use pine (2 x 4's) on a couple of bodies and it worked ok but doesn't hold the nails or screws as well. Not the same as yellow pine probably. Yes, that's the one. Most unrestored '14s that I've seen have a tear in the sheet metal right above that joint, indicating a structural problem with the wood. I like Sycamore also. No acid in the wood,light and strong.Just difficult to find anymore.I use a lot of Popular and Ash. For the "extra support for the joint on the driver's side at the upright just aft of the curve leading to the firewall," what would you recommend? Do you mean an extra piece of wood to brace it, or a piece of steel angle iron, or what? 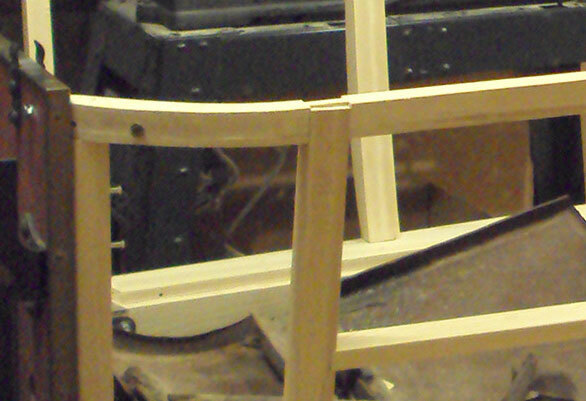 Rick, if my pictures were clearer you would see some band saw marks on the curves. I run the flat sides through my planer and hand sand some surfaces with 60 grit and/or scrape with a 3" x 5" steel scraper plate. Jack mentioned Popular and I liked it on the sides and trunk of a Buick I did a few years ago. It finished and painted well. Progress report. I got a couple more days in. Rich - .....almost seems a shame to cover up that beautiful woodwork with all that ugly ol' metal! Harold, you hit the nail on the head. The metal is ugly. I took these photos to remember how nice the wood looks before I cover it up and paint it. 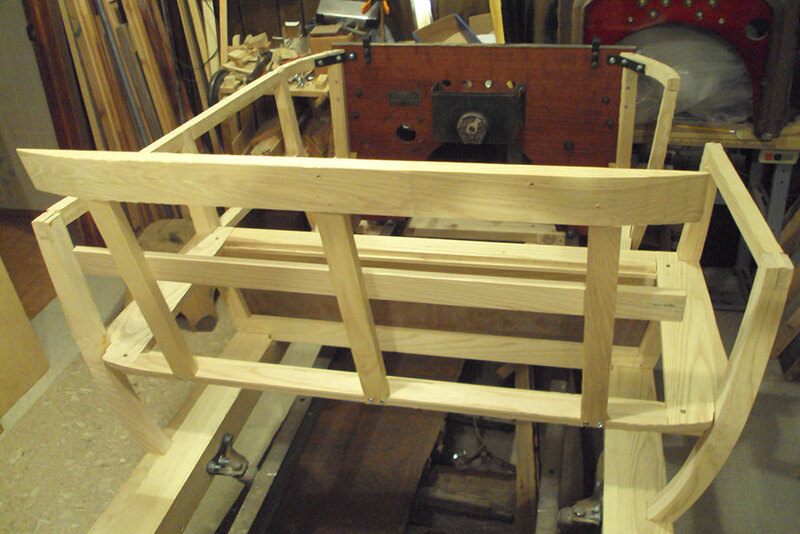 I mentioned I am building this out of panels too far gone for me to restore. However I want to do this as close to original as possible. I have always been envious of those with truly original cars that have aged well. This picture was taken after some basic straightening.